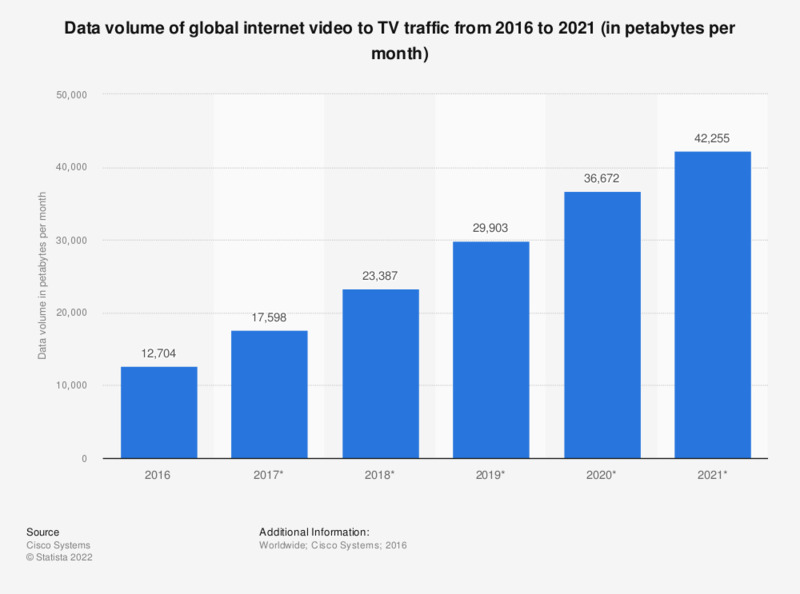 The statistic shows a forecast for the worldwide data volume of internet video to TV from 2016 to 2021, in petabytes per month. In 2018, global traffic from internet videos viewed through television devices such as internet-ready set-top boxes is estimated to reach 23,387 petabytes per month. Internet video to TV: video delivered through the Internet to a TV screen, by way of an Internet-enabled set-top box (for example, Roku) or equivalent device (for example, Microsoft Xbox 360), Internet-enabled TV, or PC-to-TV connection. Have you ever experienced problems with accessing online content or applications because your household had insufficient download capacities or the connection was to slow?